On Thanksgiving Day American people get together with their families and friends to give thanks for the past year. It is celebrated with big dinners and special food. In December, 1620, over 100 pilgrims came to America on the Mayflower and landed at Plymouth Rock. The following winter was very harsh and they didn’t have enough to eat, so more than half of them died. The next year friendly Indians helped them grow corn, barley and other crops . The harvest was good and the governor of the colony William Bradford organised a festival to thank God for the food that he had given them. 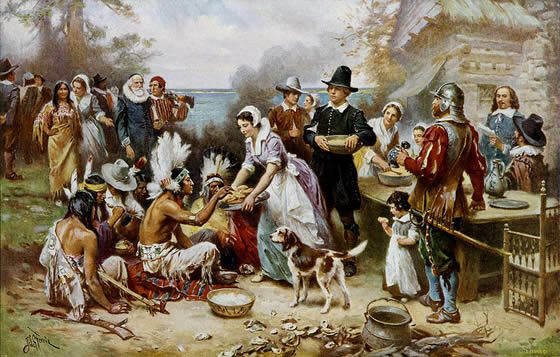 The first Thanksgiving of 1621 lasted for three days. Men shot ducks , geese and turkeys and caught fish. Ninety Indians came to the colonists and celebrated with them. As time went on the custom of Thanksgiving spread from Plymouth to other New England colonies, but for many years to come the new country had no national Thanksgiving Day. In 1863 President Abraham Lincoln formally proclaimed that Thanksgiving should be celebrated on the last Thursday of November. In 1939 President Franklin D. Roosevelt set the holiday a week earlier. He probably wanted to make the Christmas shopping season a bit longer. Today, the fourth Thursday in November is a holiday all over the United States. The turkey has become the symbol of Thanksgiving. Roast turkey with cranberry sauce is one of the most popular meals that Americans have.